A new day has broken on Jerusalem. The morning air is still cool but the sky is clearing : it’s going to be another bright day!.. Diane has slept wonderfully well and many of us want now to sleep on the terrace tonight ! While the muezzins launch their second call of the day from the top of the minarets, and while the main body of the group is still having a wash, Théodore simply goes into raptures over the sight we have from the roof of the youth hostel and keeps telling himself : "We are in Jerusalem! I can’t believe it... We are in Jerusalem!..." Anne-Claire and Louise have gone to get our breakfast. For a change, they leave for the new Jewish part of Jerusalem... For nothing : it is completely empty, except for a Palestinian taxi-driver who confirms that indeed everything is closed. "It’s Shabbat, you know! ", he tells them. Of course! It’s Saturday today...! Right... They come back to the Old Town souks where they find everything that is needed for a delicious and healthy breakfast : sesame, cheese and spinach rolls (let’s taste the local specialties! ), fresh dates, sweet-smelling oranges, which we’ll eat with yoghourt, honey and date syrup, (yummi-yummi!) tea, coffee, fresh orange juice...- a dream breakfast on a dream terrace that offers a dream sight on a dream town. And as happy things always come together, we discover that our "Jesus" from yesterday and his sweet girlfriend, whose name is Magdelene (Don’t tell me!... yes, it is! Really! ), are staying in this youth hostel too ! Daoud (David in English) leads us first to the cultural centre where he works (- a good thing : we would never have found our way in this maze of narrow streets!) There he offers fruit juice and makes us feel comfortable before starting to say a few words about the place, the Nidal socio-cultural Centre which is part of the Health Work Commitees and which - like most cultural centres in the West Bank – looks mainly after Palestinian women and chidren for whom it organizes different workshops and trainings in partnership with the neighbouring schools. 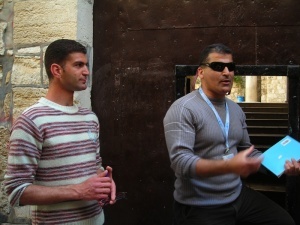 "There is much work to do on the social level in the old city : nothing is organized nor set up by the Israeli authorities for the Palestinians", Daoud tells us, "and they don’t help us with our work. Quite the opposite : the soldiers put pokes in our wheels. Last year, for example, they suddenly decided to close the dance festival we had been preparing for a long time, while the kids were already wearing their costumes, ready to go on stage ... 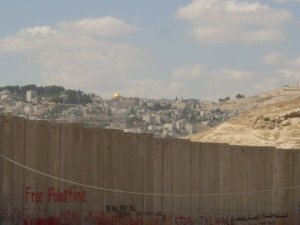 This is part of the daily vexations they inflict on us", he comments in a quiet voice... "The population in East-Jerusalem - where the centre and the youth hostel are - is mainly Arab and Christian, but the Israelis are slowly but surely taking over the district, just as they do in the occupied territories." The (substitute) guide takes the floor now... and keeps it for quite a long time. He embarks on a long monolog and starts telling us about the History of Jerusalem as seen and experienced by the Palestinians. "Jerusalem is a holy place for the Christians, the Jews and the Muslims, the guide tells us, but the Israelis (who are the powerful ones, both on the military and political levels) do everything they can to create a state of facts with the clear aim to make Jerusalem an only-Jewish town. The Christians are hardly tolerated, the Muslims/Palestinians pushed into leaving and settling in the West Bank. They are under permanent control : the old city (which is under Israeli security) is bristling with security cameras that spy on their slightest actions and movements". "Up to 1891, the guide says, Jerusalem was part of the Ottoman Empire. After WWII and the creation of the state of Israel in 1948, more and more Jews came to Jerusalem, built themselves houses outside the surrounding wall . 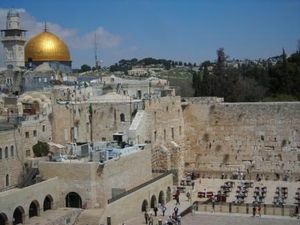 In 1950 they declared Jerusalem the "solemn capital of Israel" (which is recognized by 3 countries only, of which the USA. Embassies are all in tel Aviv). In 1967, they simply annexed the 28 villages surrounding the town (think of Bethany!) in total defiance of the Green Line so as to make Jerusalem the largest city of Israel". "Today, there about 750.000 people living in Jerusalem, 270.000 of whom are Palestinians (they represent 99% of the population in East-Jerusalem). The old city is only 1 km² in surface and shelters all the important buildings of the 3 religions, which means that the houses are really cramped (40m² per family). The old city is organised in 4 districts : Christian, Jewish, Armenian and Muslim. The Jewish district is the smallest and the most modern, the Muslim district the largest, the most crowded and the most neglected. In this district, the Israeli razed Palestinian houses to the ground in order to build the esplanade that opens onto the Wailing Wall." "The status of the Palestinians of Jerusalem is more than peculiar : in spite of being born, bred and living in Jerusalem, they are not recognized as citizens and don’t have the right to vote. On the other hand, they have an Israeli ID, yet they lose it if they decide to go and live in the West Bank. In fact, they are foreigners in their own city. When Israel started building the separating wall, many Palestinians left everything they had in the West Bank to come back to Jerusalem (even though life here is much more expensive than in the West Bank) because indeed they were afraid to lose their ID and be prevented from ever coming back home..."
"For Israel, there are 3 kinds of Arabs, each with a different value in the Israeli’s eyes : on top of the scale you have the Arabs of Jerusalem, (= the Israeli Arabs), in the middle the Arabs of the West Bank (= the territories occupied by Israel), and at the bottom, the Arabs of the Gaza Strip who actually live in an open-air prison. The Arabs living in the West Bank can’t go to Israel, the Arabs living in Israel can go to the West bank but are denied a number of things - for example they can’t build on new ground : the only possibility for them is to add storeys to existing houses. Consequently when children get married, they generally have to live above their parents’..."
It’s getting hotter and hotter in the Nidal centre and the guide understands it’s high time we all went outside in the streets of the old city... There are indeed security cameras everywhere, most of them well-hidden... The guide takes us to different places rich with history (among others, remains of Roman roads that don’t exactly thrill us to bits...) The fact is the poor guide is at his wits’ end with us as he doesn’t understand what we would like to see and know. "Usually, the tourists tell me what they want me to show them", he says. Yet we have no special requests, apart from discovering the Jerusalem of the Palestinians.